Well, look on the bright side, New England fans. At least no one on the street got to check out your mammogram records. That’s what happened to a 54 year old New York woman. 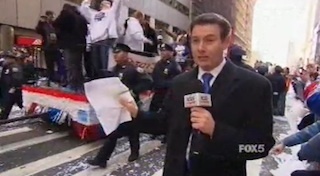 You see, during the Giants’ big celebratory parade on Tuesday, businesses along the route were supplied with confetti to throw out. Unfortunately, some people got overzealous and started throwing out any paper they could find in their office without even shredding it. This meant that documents featuring people’s social security numbers, legal statements, and medical records were gracefully gliding to the ground. That’s the story from Inside Edition and it’s kind of hilarious. I mean, it’s horrible and pretty frightening. But it’s still kind of hilarious. As of yet, there’s no way to know if your information was included in the parade unless a news reporter randomly appeared at your house holding your bank statements and asking you how you feel (which they totally did to some guy). Basically, the best test I can think of is, if you’ve worked with a business along the route of the parade, go to their office and ask for your records. If they can’t retrieve them for you and quickly try to hide the Giants hat they were currently wearing on their head, it might be time for you to change your credit card passwords.